Not content with providing Britain's greatest pothole in Gaping Gill, the environs of Clapham also contain a cavern which claims - and with real justification - to be the 'finest show cave in the country.' The cave is of such grandeur to merit the name of the mountain which it graces - and needs no greater honour bestowing upon it than that. 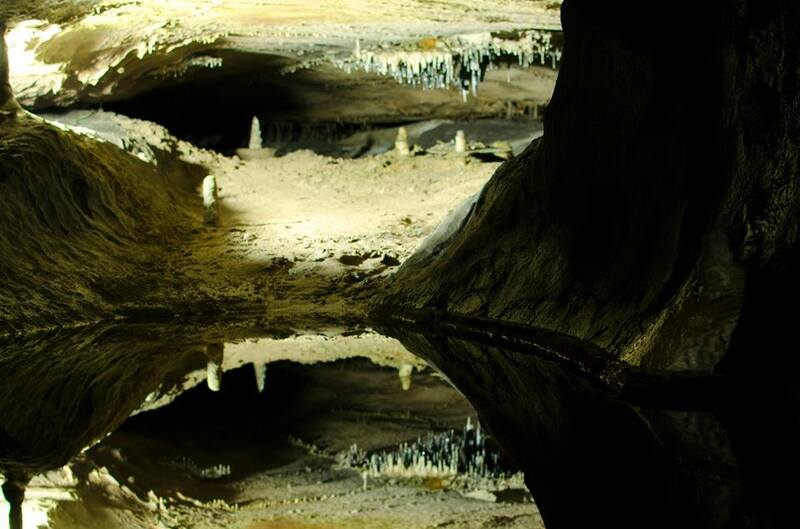 Ingleborough Cave - sometimes called Clapham Cave - is a masterpiece of the underground world of the Yorkshire Dales. No coach parks or commercialism here. All is kept to a minimum - with a stunning walk up through the sylvan woodlands of Clapdale to savour before the experience itself. I can never get a decent picture of Clapham falls, such is the contrast between dark vegetation and foaming white water. Artificially created by the Farrers of Ingleborough Hall, who dammed the valley to create the lake above - they were hidden by vegetation for many years, until recently revealed once more. In spate, they are a magnificent sight. The Farrers were no doubt keen to show their visitors the delights of Ingleborough Cave, and the track through the dale was soon widened for the passing of horse and carriage, with elaborate stopping points along the way, like this well known 'grotto' complete with vaulted ceiling. Such elaborate construction would cost a fortune today. The Grotto has the appearance of a chapel, with grotesquely carves limestone boulders protruding above the doors and windows. Looking back down the elegant, tree-lined Clapdale Drive, laid out by the Farrer family. Wild garlic is very much in evidence. The trees hide the fact that the slope on the left drops into a tremendous ravine, with Clapham Beck (formerly Fell Beck before dropping down Gaping Gill) winding its way down towards the lake. The woodland path opens out into a wide dale, with the stream now very much in evidence. The small hut at the entrance to Ingleborough Cave can be seen in the left background. This is when things start getting exciting, as they always do on Ingleborough. Clapham Beck winding its way down the dale. It has, at the top of the photograph, just emerged from Clapham Beck Head, just by the fence at the top left of the photograph - having last seen the light of day several days before when dropping into the tremendous shaft of Gaping Gill, less than two miles to the north. Get your head around that one! You wouldn't think that this innocent looking stream had been through such turmoil, would you? The impressive entrance to Ingleborough Cave always gives me a sense of excitement no matter how many times I have visited. It clearly once discharged, many years ago, the waters from Gaping Gill, as can be seen from the shallow dry valley - the former stream bed - now swathed in grass on the right of the photograph. Things are a bit more comfortable nowadays. It is still possible to see where that original barrier was, but concrete paths have now been laid to level the floor. Aside of that, the cave is very much how James first saw it. Little has been done to spoil its natural beauty - and that admission fee is worth every last penny. Even just a few yards in , the beauties start to reveal themselves - many of the pools, hemmed in by stalagmite, being crystal clear. The Mushroom Bed, sometimes called the Woolsack - is a gorgeous white pillow of stalagmite, with delicate honeycomb structure. Beside it, to the left, are typical flowstone 'organ' like structures, so typical of the Yorkshire caves. Features like this have built up over thousands of years - where calcite rich water has seeped into crevices causing a plug of stalagmite to build up. The contasting colours are impressive. The 'Inverted Forest' area of the cave, just inside the entrance, shows peculiar features, some of which appear to have formed beneath the old level of the lake, as can be worked out by comparing with the 'tide mark' on the wall. This photograph of the passage, close to the Mushroom Bed, shows the difference in colour between the rock revealed in 1837 (bottom) and the darker limestone above - with the obvious former water level easy to follow. After heavy rain, some spots are more vulnerable than others. Here the slowly dripping water has altered the composition of this beautiful golden 'haystack' of calcite, smoothing out the honeycomb effect with new layers of deposition. The Eldon Hall reaches its climax at the stunning Beehive formation. In this picture, the former water level can clearly be seen at centre - the tiny protruding fingers of the Beehive being an ideal indicator of stalagmite formation times, as those final centimetres have taken an incredible 176 years to form! The cave's most famous stalactite, the massive 'Sword of Damocles' adds to the glory of the scene on the right - over 2 metres (7 feet) in length. The Sword of Damocles is, unquestionably, one of the finest stalactites in the country, and is worth the entrance price alone, in my book. If you consider that one of those tiny stalactites in the ceiling would have been forming before the reign of Queen Victoria, then that gives a mere indication of the age of this monster. Eldon Hall is left where a stalagmite barrier is crossed by a little bridge to meet the Elephant's Legs, two specacular calcite columns, where stalagmite and stalactite formation has combined for the overall effect. Note his tail too - a stalactite well placed. Oh, and you can use your imagination with any other appendages! On the left, the delicately illuminated chamber, never overpowering, manages to do justice to great sights like this exquisite pillow of stalagmite. The famous 'Pillar of Inglebrough Cave' is then reached - where Professor W. Boyd Dawkins began, in the 19th century, experiments designed to show the rate of growth of cave formations. It is a perfect example of a joined stalactite/stalagmite, and must be of an immense age. Beyond looms a pothole within the cave floor, termed 'The Abyss' and leading into tight, awkward passages. It is, perhaps, an exaggeration to call it an Abyss, but it is still an interesting feature of the cave nonetheless. Beyond, on the left, is the bizarre Showerbath, or Queen Victoria's Bloomers. Described by Albert Mitchell in Yorkshire Caves and Potholes as 'a couple of Yorkshire hams, hanging from the wall.' A strange, plant-like shape has developed on the stalagmite beneath, noticeably symmetrical. Nearby is this wonderful encrusted Gour Pool, forming on a stalagmite barrier. After a back-breaking low passage (well, it is when you are six feet four anyway) you emerge at a T junction with the right branch leading off to the lovely Gothic Arch. On one side is the First Ring of Bells, while the Lady's Cushion can be glimpsed through the archway. The 'Coffee Pot' is an impressive small stalagmite formation on the right of the conitnuing cave passage. Close-up of 'The Coffee Pot' and a drink of it would be more than welcome at this point. As with so many 'Organ Pipes' in the Dales, these produce delicate musical notes when lightly tapped, though it is wise never to touch such delicacies. This stalagmite needs no further explanation: The 'Ingleborough Buddha'. There are also many impressive Stalagmite 'Skittles' along this passageway. Towards the end of the accessible show cave, this fossilised coral can be seen on the left wall - the large, wide scallops in the limestone indicating that water has usually once moved slowly along this passage - rather than at force. Here's another fine example on the ceiling. The famous 'Pool of Reflections' was first noticed by the early explorers and gives one the sense of looking into the wing mirror of a moon buggy. Stalactites on the ceiling take on the appearance of a distant city when reflected in the crystal clear pool. Simon kindly loaned this great picture as none of my attempts were successful. Thanks, Simon! Suddenly - all comes to an end. Eerie, forbidding passages filled with glacial debris open up unpromisingly ahead. The artificial lights subside. This is where the tourist must turn back. The passage is open to cavers, who use it to reach a long pool called the Styx, leading into Cellar Gallery and Giant's Hall. These features mark the limits of the original exploration. Only after 146 years of exploration did divers finally make the suspected link with the waters of Gaping Gill, when, on 22 January 1983, Geoff Crossley - diving the tight sumps beyond Terminal Lake upstream, made the historic handshake (or bootshake to be precise) with Gerald Benn who had made his dive into the Far Waters at the Gaping Gill end. This was one of the greatest achievements in British cave exploration. Will a dry link ever be discovered? Who knows? Stunning pools with a quaint little 'font' or hand-basin for the underworld inhabitants. Even the vibration of voices makes delicate ripples on the water surface. A final, irresistible view back to the magic of Eldon Hall, with the Beehive and Sword of Damocles. Ingleborough Cave is reached by taking the Nature Trail from Clapham (small admission fee to trail: pay at machine on entry). The walk both there and back is through lovely woodland, impressive at all times of year. As an introduction to the beauties of the underworld, Ingleborough Cave can't be surpassed for grandeur. Years since I was in there and had almost forgotten how superb it is. In the old days invariably knew the people taking the cash and never had to pay (which made the experience all the better..
many thanks Stephen for your "professional" depiction of the cave.